The fall tournament season has concluded, and results are final for the remaining events of the semester. In the most recent update to the Bass Pro Shops School of the Year presented by Abu Garcia, a major shakeup has occurred toward the top of the standings. Adrian College no longer sits in the number one spot. After holding that position since the 2018-19 season started, Adrian relinquishes their lead due in part to the overwhelming success of McKendree University. McKendree University managed to edge out second place by just 60 points to become the current leader in the School of the Year race. 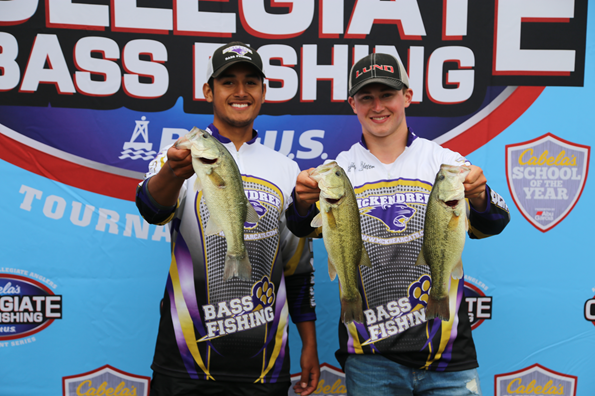 A strong fall season is what has propelled the Illinois based team to the top spot of college fishing’s most prestigious title. “We are absolutely thrilled to be sitting in such a great position going into the spring season! The School of the Year competition is loaded with outstanding teams and anglers from all over the country, so we are really excited about where we are,” says Jon Rinderer, Bass Fishing Coach at McKendree University. Recent performances this fall can be credited for this climb into the number one spot. 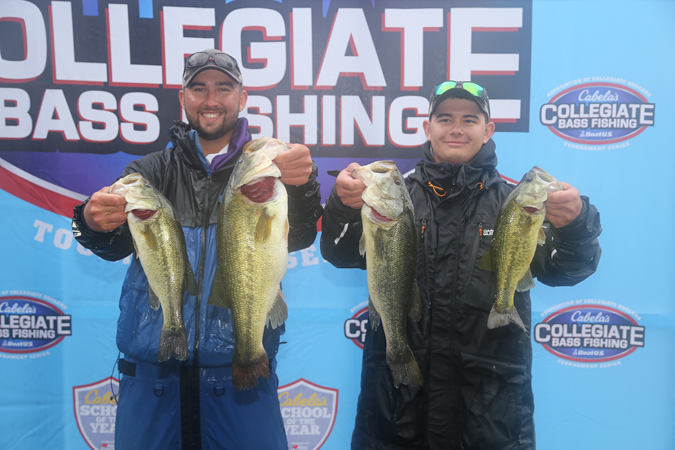 At the AFTCO Collegiate Bass Open in October, McKendree University earned a total of 905 points. This point total is more than double that of what the former leaders, Adrian College, gained at Lake Dardanelle. The team’s performance at that event in October helped McKendree to close the gap near the top of the leaderboard. Entering the 2018-19 season, the Association of Collegiate Anglers announced a number of changes in regard to points distribution as it pertains to the Bass Pro Shops School of the Year presented by Abu Garcia. To view those rules, CLICK HERE. Here is a brief highlight of two of the major changes: school run events become more valuable, and for major ACA events points are paid out to only 100th place. The intent of these changes was to create an even more competitive race for the School of the Year title. Up to this point in the season, we are witnessing just that. Very seldom do we see a margin as close as this towards the top of the leaderboard. McKendree University currently holds a 60-point lead over Adrian College. Take a quick look at the points breakdown and you can instantly see where McKendree is capitalizing on each opportunity. From local school run events, to major ACA ran tournaments, they have managed to accumulate valuable points. “As with any competition, being active and having consistent finishes is the key to be number one, whether it be a school run event or one of the major events,” notes coach Jon Rinderer. Although the season is entering the second half of the year, there are still numerous opportunities for teams to make a run at the title. In ACA events alone, there are three more tournaments. Each one will present the opportunity to earn double points as well. A good start to the year may not ensure a victory in the School of the Year race, but it provides a team with much needed confidence to go out and compete in hopes of taking home the title. “With being ranked number one in SOY, it brings great momentum heading into spring. We will all have the mindset to finish the year off strong and to maintain the number one spot,” says sophomore Nate Doty. Sitting in second place is the aforementioned Adrian College. After a long run in the number one slot, the Michigan based anglers have dropped one spot. Right behind them in third is Murray State University. The top three teams are separated by only 150 points. 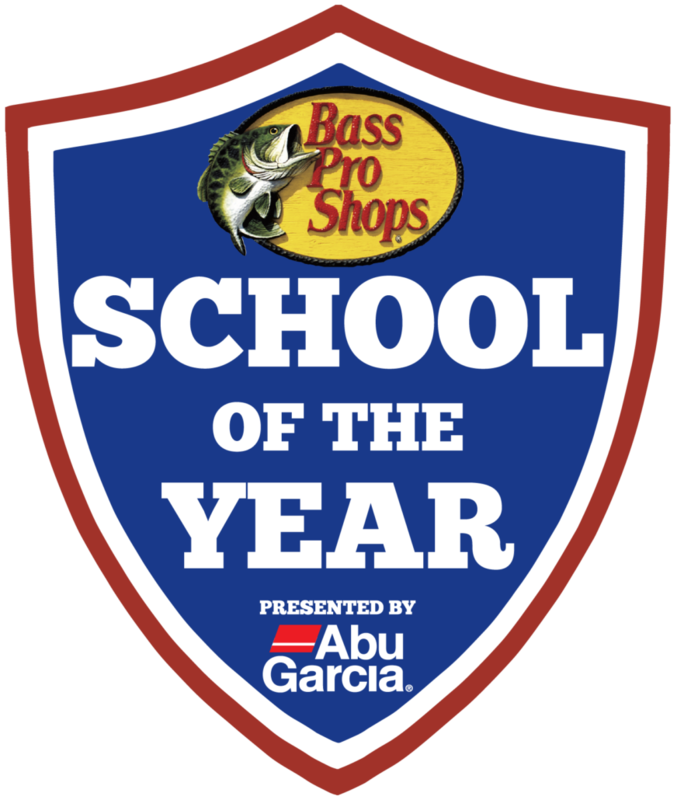 To view the complete standings for the Bass Pro Shops School of the Year Presented by Abu Garcia, CLICK HERE. The chase for the Bass Pro Shops School of the Year presented by Abu Garcia is always very intriguing to monitor. 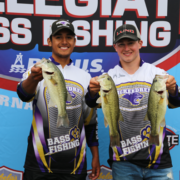 Continue to follow the Bass Pro Shops Collegiate Bass Fishing Series as teams strive to claim the Bass Pro Shops School of the Year title when the season starts back up after the new year.